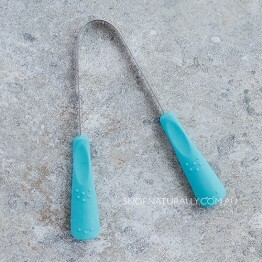 The use of a tongue scraper in natural dental care is one grounded in Ayurvedic medicine. This tongue cleaner is a simple curved piece of metal (or sometimes plastic) that you gently scrape along the tongue as a part of your dental regime along with your natural toothpaste and bamboo or biodegradable toothbrush each morning and night. We don't stock plastic tongue scrapers, but we have two alternatives in the metal options, stainless steel or copper. In Ayurvedic medicine, the copper tongue cleaner is the traditional choice as copper is naturally resistant to bacteria. Many combine it with the practise of oil pulling. Stainless Steel tongue cleaner (#1 selling) that aids to remove the bacteria that cause bad breath.